Iris Gabriel, who once aspired to be an actress, played her most important role as a humanitarian. She proposed an idea to Massachusetts Governor Robert Bradford for Thanksgiving of 1947. Why not ask everyone hosting a Thanksgiving dinner to take in a “silent guest,” one of the world’s starving people? People would then send a donation to feed the silent guest. The plan took off, with Bradford’s support, and it led to the purchase of thousands of CARE packages forwarded to the hungry in Europe. The program continued well past Thanksgiving too. Today, the “silent guest” heroics are needed again as famine threatens. 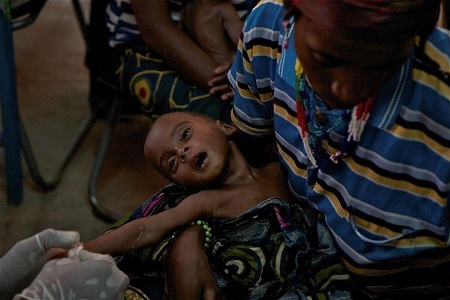 Children are starving to death in Niger and other countries in the Sahel region of West Africa. Severe drought and conflict have led to food shortages. If we respond now, we can save many lives. But aid agencies are lacking funding and the world is slow to turn its attention to this crisis. If everyone will take the initiative, we can stop the tragedy. I just made a “silent guest” donation to Save the Children’s West Africa relief fund. If everyone did this at their next meal, it could help Save the Children’s relief work in Niger and the other Sahel countries. Do not wait for the G8 to take action. Show them how to take action. Tonight at dinner imagine having one of the children in Niger as your guest. You could change a life by making a silent guest donation. Even a few dollars can buy a number of servings of the life-saving food Plumpy’nut. Read this article by Annie Bodmer-Roy of Save the Children as she tell us about the tragedy taking place in Niger. The Silent Guest reminds us of what is the right thing to do for humanity and building lasting peace. I think Americans can respond like this again and save lives. You can help Save the Children’s West Africa Emergency Fund. Article first published as Famine in Niger: Silent Guest Donations Needed to Feed Starving Children on Blogcritics.